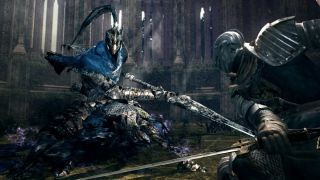 Dark Souls: Prepare To Die Edition dumped Games for Windows Live in December, but something went a little screwy in the process and when the move was complete players noticed that they could no longer join multiplayer gamers with people outside their home region. It's not exactly the biggest problem in the world, but nonetheless it's now been resolved. A "nice fix" released yesterday removes the region lock and also fixes a crash that could crop up when opening the Book of Guilty. To install the patch, simply ensure that auto-updates are enabled and fire up the game. That's it! The nature of Dark Souls doesn't really encourage regular online play with the same handful of international friends anyway, but it's nice to at least have the option. And since there's really not much more to say about it, here's a video of a guy completing the game in less than 50 minutes. Try not to feel too inadequate as you watch. It's too late for us.